Thank God its Sunday! I love weekends, too bad it only lasts for 2 days! Teehee. 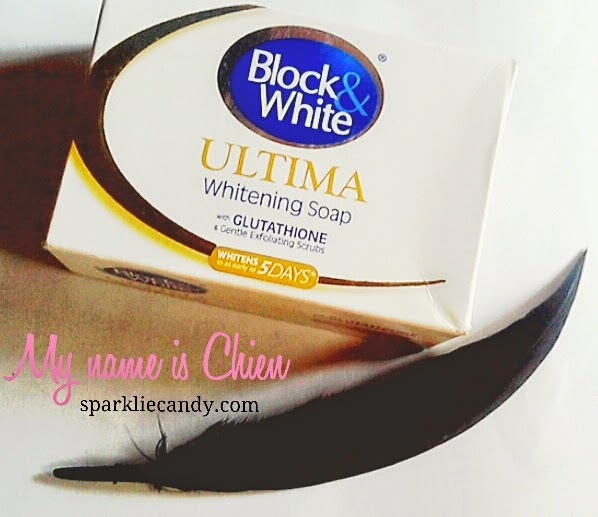 So today is another whitening soap review. I can't help it. Haha. I think I need something to whiten spots I got from my skin allergy last time. I know how effective kojic soap is in whitening but I just can't use it because I get small bumps whenever I try. Plus it is too harsh for my face. After years of trying different products I came to realize that only gentle products should be used when it comes to face. 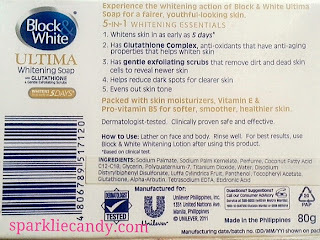 Looking at the soap racks I saw Block & White Ultima Whitening Soap. I remember how other gtalkers raved on the effectiveness of the B&W Ultima Lotion. I was sold on its claim that it whitens as early as 5 days. Who doesn't want fast results right? 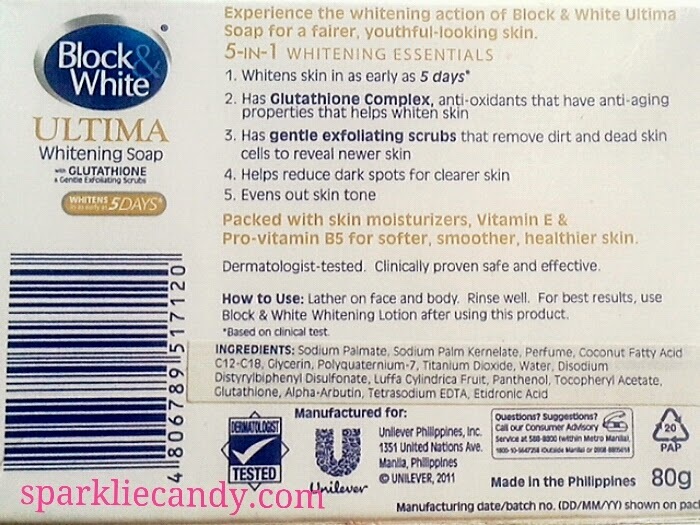 Block & White Ultima Whitening Soap is a Glutathione based soap that claims to give results in just 5 days. White with gold design box. Seems to be a box for a luxury soap for me! At the back, you'll see more of its claims and ingredient list.I bought it for whitening but it also has anti-aging properties which is a bonus. One thing worth noting is that it smells nice! I am not good at describing scent but it is something feminine. The soap does contain visible gentle exfoliating scrubs (no visuals!) I don't think it helps with anything unless you are going to hardly rub the soap into your skin? Besides being said that the soap contains skin moisturizers, my skin still feels kinda tight after usage. I notice some glow as well which is something I like! I can't remember how much but it is less than a hundred for a box. If you have ultra sensitive skin, I do not recommend drying soaps for your face. No. It is not effective for me. I use Kojie San only on dark spots. It actually tame my bumps in forehead. Too bad it worked differently on you. I recently just bought this Block & White. Affordable. It has glutathione. I'll review it next time.